Obama's health care reform: for the people? For the insurance companies! 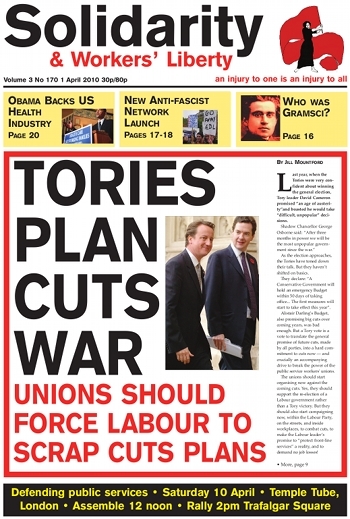 What is the Socialist Campaign to Stop the Tories and Fascists? British Airways dispute: "we've got to be ready to stand up again"
Civil Service strike: full rights for all! My life at work: "The days of the 11am finish are long gone"
The unions control Labour? If only that were true! John McDonnell says: probe links between the top of New Labour and big business! After Bolton: drop the charges against the arrested anti-fascists! Royal Mail: vote against this deal! BA cabin crew have now taken their seventh day of strike action in their embittered battle with union-busting management. According to the most conservative estimates, the strike has so far cost BA around £42 million, but the real figure is probably much larger. BA boss Willie Walsh is desperately trying to win the confidence of investors and is spinning the figures. If the cost of his elaborate strike-breaking measures is taken into account, the dispute is probably costing nearer £100 million. GMB members working for British Gas have voted overwhelmingly to strike against management bullying. Over 82% of workers voted for a strike, and 90% voted for action short of a strike. Most people know the none-too-funny joke: “Every time the English find an answer to the ‘Irish question’, the Irish change the question”. The United States spends almost twice per capita for health insurance coverage than most other advanced capitalist nations and still leaves almost 50 million Americans uninsured. About 45,000 people die each year due to lack of insurance or the inability to access the insurance they have due to inadequate coverage. At the rate in which health care costs have been climbing, 20% of consumer spending would be captured by health care costs by 2017. On Monday 1 March many thousands of migrants together with other Italian workers, activists and trade unionists demonstrated in various Italian cities. They were denouncing institutional racism under the Berlusconi government, claiming to be “the new citizens” and demanding rights to work contributions and other labour and social rights not currently available under Italian migration law. According to the website of the committee organising the strike, a number of “firm-based trade unions” (the “Rappresentanze sindacali unitarie”) called for the strike of migrant workers. According to press reports, on Wednesday 29 March two women suicide bombers exploded their bombs on the Moscow underground. The blasts, timed to coincide with the morning rush hour, killed at least 38 people and injured many more, several seriously. According to local analysts the likely culprits are Islamist rebels from the North Caucasus. The most probable of these are those based in Chechnya using so-called Black Widows as bombers (women who have had husbands or brothers killed by Russian or Russian-backed forces in the region). A decade since Hugo Chávez proclaimed the “Bolivarian revolution” in Venezuela, his project is mired in stagnation. For all the rhetoric about “21st century socialism”, the Bonapartist regime continues to preside over Venezuelan capitalism and to stifle the emergence of a genuine independent labour movement. The hostility of the US government may have made Chávez an “anti-imperialist” icon, but it is fantasy to believe his forces are part of the revival of working class politics. The Tories’ recent attempts at wooing the LGBTQ community shouldn’t fool anyone into thinking that the party can address LGBTQ liberation in any meaningful way. Gay rights campaigners who have taken to schmoozing the right, in expectation of a Conservative victory in the coming election, have clearly lost sight of the rights of the people they claim to represent. The English Defence League and anti-fascists descended on Bolton on Saturday 20 March, with up to 2,000 on both sides. We were met by a heavy and violent police presence — mainly violent against the anti-fascists. Police violence seriously damaged the ability of anti-fascists to confront the EDL. Anti-fascists, including local community activists, trade unionists and Asian youth, were separated from each other, kettled, and subjected to considerable force during the long and restless counter-demonstration.